IPOB S-KOREA EXPRESS IT’S MORE RESOLUTE AND INDEFATIGABLE STAND FOR BIAFRA RESTORATION. October 06, 2017 Friday when IPOB S-KOREA general meeting at Solid rock mission church opposite Busan station Dongducheon, under the lead of its firm and resolute leader National Coordinator Mazi Ugwu Okechukwu had once again done blow up their steady and unchanging stand for Biafra restoration Under the leadership of Mazi Nnamdi Kanu to move on no matter what it takes. It can be seen in every eye and faces of the children of the highest inside the family of IPOB S-KOREA the grief and pain they felt for our fallen brothers and children of our beloved land. Yes, the zoo is too much provoking, and disturbing in the movement of our beloved Biafra project, the killing, and torturing of our people and kidnapping is highly stimulating and rise to the height beyond our arms can reach. IPOB S-KOREA shall not be move nor be threatened it’s stand to continue and sound more our horns to all the world how we need freedom for Biafra and stay focus. Thank you Chukwu Okike Abiama (Almighty God our Father) for preparing us the hearts of your people to understand the need of freedom of your Kingdom Nation Zion! Thank you for the resoluteness of the spirit in our leader’s heart Mazi Nnamdi Kanu and our able Deputy Mazi Uche Mefor down to all your children of light and Justice in Biafra land and throughout the whole planet. 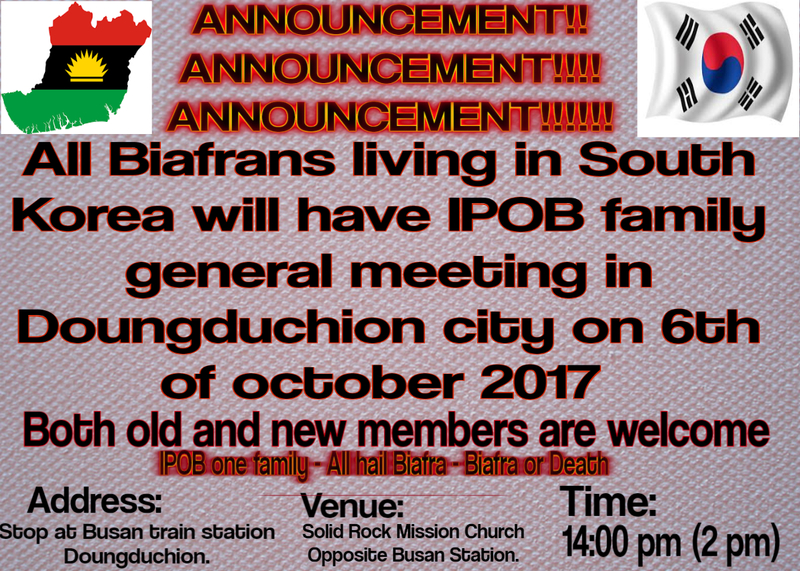 We the IPOB S-KOREA family do standing more in higher spirit day by day as the final battle increases its pressure. Creating movements to aid faster through direct or semi-direct ways to disseminate information and actual visual happenings in Biafra land to all our honorable Embassy’s Offices and even to reach it out to Human Rights and the UN to counteract the criminal threats of Nigeria governance against the innocent people the Biafrans. IPOB S-KOREA hate to sleep at night while our land BIAFRA is in oppressed by this unlawful killings, torturing and secret kidnappings of our population by the Nigeria Soldiers and Police authorities which by which authorities should supposedly to give security of this said civilian communities the Biafrans but NO! Thank you Chukwu Okike Abiama (Almighty God Our Father) for giving us our National Coordinator Mazi Ugwu OKECHUKWU having with a big heart to stand and manage your sanctified family in S-KOREA the IPOB S-KOREA Chapter. ALL HAIL BIAFRA!!! IPOB ONE FAMILY!!! !